There is a plague in the streets of Sri Lanka. If this plague has not entered your door steps, your family will still pay an indirect price. Most of us were aware of what ruffled the normal tenor of our lives but had no idea how to fight the plague. The plague is known as “Corruption”, and it might be inimical to the stability and integrity of the economy, which now threatens the entire nation. 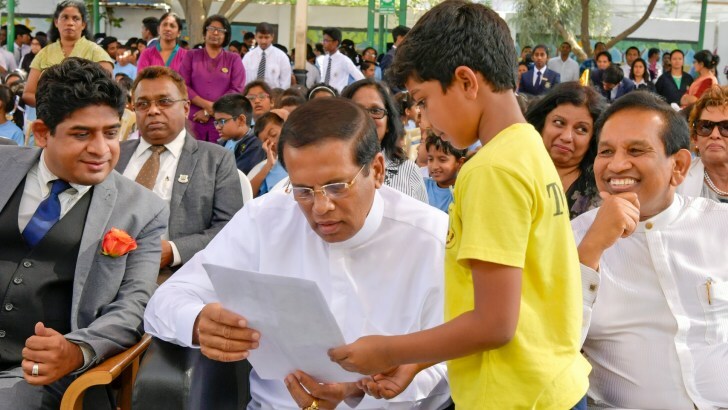 President Sirisena explained that he is not in a position to open the newly built hospital in Hambantota, which he laid the foundation for several years ago when he was Minister of health. “The building is completed but the hospital equipments has gone missing and all funding has been utilized, certain people who where after my term at the Ministry are directly responsible”, said President Sirisena to the Director General of Bribery and the Key Note speaker Prof. Jayadeva Uyangoda after a discussion on fighting corruption in Colombo. Whoever is responsible for robbing public goods should be arrested regardless of their political hierarchy or affiliation. If the powerful (top beam) in society could commit economic crime of this nature, one may wonder how we create a society free of corruption, and instill such values within the entire community. The President will need to take strict measures to arrest the culprits and strengthen weak government institutions, in order to fight corruption. According to Auditor General Gamini Wijesinghe, “More than half the state officials would be in jail by now if they were dealt with in the manner in which former presidential secretary Mr.Weeratunga was dealt with and sentenced to prison on charges of misusing State funds”. Due to the large scale corruption, Auditor General suggested the new Audit Bill as a solution to ensure financial discipline in the State sector under the 19th Amendment to the Constitution. Such measures should be given utmost government support and top priority, especially considering the events which unfolded in the recent past. Passing the Audit Bill is not sufficient, but getting it implemented should be the key, explains former Auditor General Mayadunna. Economic crime such as leasing the entire fishery harbour in Modara (Mutwal) Colombo a few years ago by a powerful Minister for a nominal fee was never investigated by the Bribery Commission. It is the duty of the commission to carry out investigation of all crimes, regardless of the culprit’s social standing. According to Anura Kumara Dissanayake, leader of the JVP, “The Bribery Commission has summoned him on two occasions to appear before it to inquire into the harbour tender, but the Minister had not gone there. Instead he influenced the President to remove the Director General of the Bribery Commission”. The rule of law should apply equally to all citizens. According to Prof. Jayadeva Uyangoda, a new “Perpetual class” has emerged in the Sri Lankan society. This constitutes a new rich middle class, who are much more sophisticated when it comes to influencing politicians, political parties and campaign funding. There are evident differences between this new rich middle class and past businessmen. This Perpetual class exercises control and influence over ministers, high ranking officials and decision making of the state using their financial power. Prof. Uyangoda further explains that there is a need and it’s worth researching to understand the influence of such new middle class in our society. The practice of political funding and lobbying has changed in many societies including in the United States. As Francis Fukuyama rightly identifies in his book ‘Political Order and Political Decay’ that there were only 175 lobbying firms in 1971, in 1981 number reached 2500 and by 2013 a whopping 12,000 firms spent $3.2billion on lobbying, according to Fukuyama “its these firms that distort American public policy across many different areas”. The 2015 Presidential election followed by the August general election was held under the central theme “Corruption of the family”. Today, the theme has transformed from the Rajapaksa family to another direction, the “P118”. The P118 is the list of 118 Members of Parliament (MP) who has accepted funds from Perpetual Treasuries which has become the discussion among mainstream media in Sri Lanka. During the last few weeks few MP’s were questioned by the authorities, one member of parliament who authored a book of the infamous bond scam by Perpetual Treasuries has also accepted Rs.3 million, which he again justified to give back to the poor of our society. According to some individuals there is no such list. Since the Government championed and introduced the Right to Information (RTI) Act, the public has a right to know if such a list exist. The RTI commission showing its strength, recently ruled that two termination agreements entered into between Sri Lankan and AerCap which caused great losses to SriLankan Airlines will be released. The order by the commission explains ‘where the public purse is concerned, and the alleged financial irregularities of a particular Public Authority are under scrutiny in an Appeal before us, this Commission will be particularly watchful of the public interest.’ In the same manner, the commission could assist the public to reveal the P118 list, this time the ‘particular public authority’ will be the Parliament of Sri Lanka. Since the RTI is in full motion, politicians also could assist the commission by revealing information to the public, including the former President who claimed he has files of the corrupt. Economic crime is perhaps the largest national security threat the nation is facing right now and it directly relates to the financial accountability and transparency of the Public Authority and individuals representing in the Parliament who craft policy protecting the sovereignty of the people. If policy makers could be easily influenced by lobbying groups, foreign policy, national security and people’s sovereignty will be threatened. Sri Lanka has much to learn from the above four areas. Out of the 72-month Presidential timeframe, there are roughly 15 months or less before the next Presidential election. Can we expect some significant results in the next few months to take place by the Executive who was appointed by the people to hunt the corrupt?